Home / Blog / Dogs vs Cats, which is better? Dogs vs Cats, which is better? The debate dogs vs cats has raged on for as long as I can remember (which is about 40 years, give or take!). Rather than get all emotional about the subject I have approached it with science and facts. I have then applied a subjective points system for the final verdict, so totally independent…. We have reviewed three key components in the Dogs vs cats debate. These include companionship, intelligence and physical fitness, in much the same way modern day dating apps profile potential partners! It depends…. This sounds like a copout, in reality all animals (including us humans) have their own personalities. It seems somewhat elitist and arrogant to generalise about other species without some hard evidence. However, as we are looking to make a judgement, we will examine some of the available evidence. Dogs are well known for being pack animals, the whole pack is stronger together. When you compare cats, lions are the only cats that act as a pack, all other cats are solitary animals (other than cheetahs who live in pairs). This leads me on to look at dog’s vs cat’s behaviour. Dogs are well known (generally) for socialising with each other (smelling butts etc!) and will defend their pack at all costs (usually this includes the whole family). On the other hand, cats will protect their patch (territory) but they do anything to avoid conflict. The evidence thus suggests that dogs are likely to make better companions. We should also take into account the strong bonds cats can form when they develop familiarity, particularly as kittens. Overall, we believe the evidence both scientific and anecdotal would suggest that dogs are generally better companions. Many believe cats to be more intelligent, this comes from the fact that cats pretty much do as they please and get fed. Dogs on the other hand tend to be more confined and constantly seek approval from their owners. Equally dogs are trained to perform more complex tasks from sniffing out cancer (as they dog at Medical Detection Dogs) to catching criminals. It has also been long believed that there is a relationship between size of brain and level of intelligence, but this doesn’t always correlate. 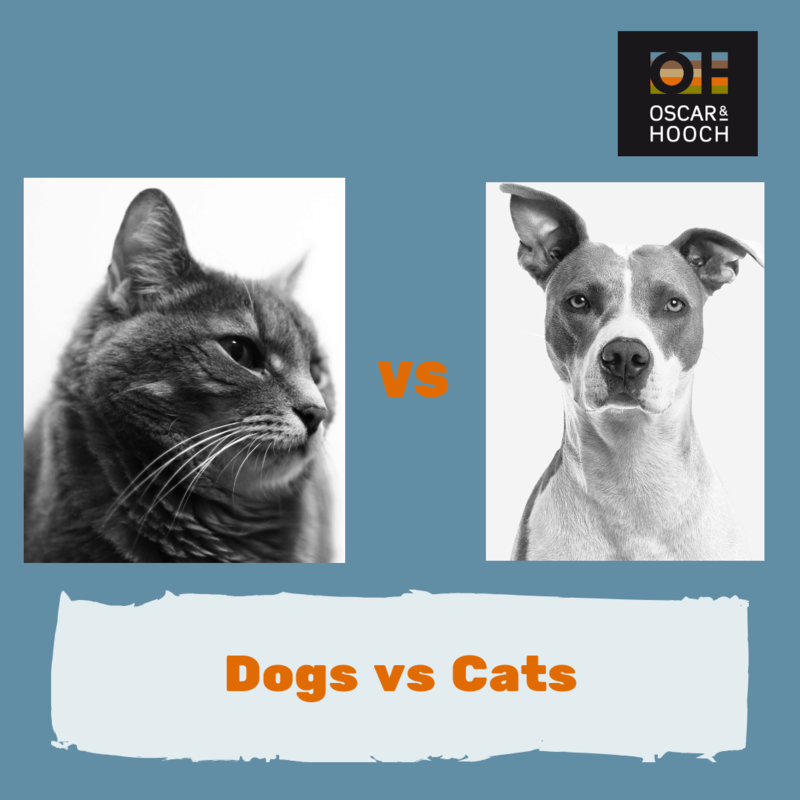 More recent scientific research (conducted by scientists from Brazil, the US, Denmark, Saudi Arabia and South Africa) compared the number of neurons in different animals (including dogs and cats). Neurons are important as they are the units in the brain used for processing information. The theory carries that the more neurons present in the cortex (the decision-making centre of the brain) the more intelligent the animal. In this study dogs were found to have around 500 million neurons vs. cats 250 million. For comparison humans have around 16 billion neurons, the nearest non-primate animal is an elephant with just under 6 billion. Dogs were comparable to racoons and lions, cats were roughly equal to bears. To make this a fair comparison we have look at both flat out speed and also endurance. I have also taken the liberty of comparing the fastest of both species (domesticated). The fastest cat is the Egyptian Mau which can reach speeds of up to an impressive 30mph. The fastest dog is the Greyhound which can reach speeds of 45mph!! If we then compare endurance cats can be very quick for short bursts but on average your dog can keep going for a very long time. This is replicated in the wild with cats having an ability to hunt for short bursts and then needing to recover. 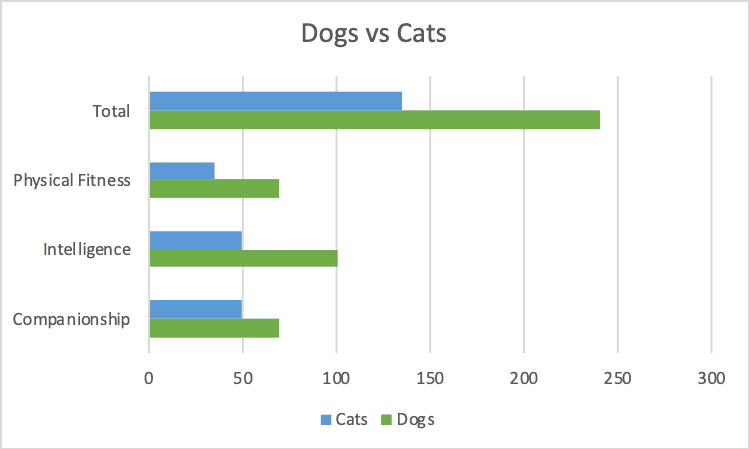 Using a highly scientific scoring system our summary would conclude that dogs have it by a whisker…. Ultimately dogs and cats both make great family members and we are sure this debate will continue. If you’re really not sure, then get both!! 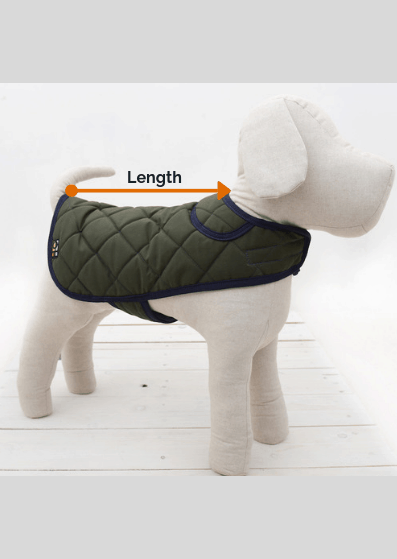 To view our range of dog accessories shop here.